Our 4th annual Christmas celebration is set for Thursday November 29th at the Hugh John Flemming Forestry Centre in Fredericton, NB. It promises to be a night to remember. With some returning musical talent and special guest Josh Nevers of the New Brunswick Sledge hockey team you won’t want to miss an evening to get into the Christmas spirit. Join us at 7 pm on Thursday November 29th. Morning Gate Church is hosting its second Sweet Worship event on November 30 starting at 7 PM. This will be a kickoff for the Advent Season. Please join us for a fun evening of Worship, Fellowship and delicious desserts. There will be a freewill offering for Village of Hope. If you need any information, please feel free to contact Helga Rennke at helgarennke@gmail.com or by phone at 260-2017. We hope to see many people there! Check out my piece that aired on AMI Television on December 25th. Becka de Haan Profile | Accessible Media Inc.
Becka is among the many performers of this year's Campobello Island Fog Festival! Check out the full and exciting line-up on the Fog Fest Website: www.campobellofogfest.com. During Mary's month of May, join ECMA-winner, Becka deHaan, in exploring the joy, trial and triumph of Blessed Mary, and in proclaiming the Virgin Birth of Emmanuel, God With Us. There will be a free will offering with the proceeds going to the Fredericton homeless shelters. As the December 9th showing of this event was also our first snowstorm, the weather deterred many from coming. So we thought we'd offer the concert again, on the last night of the month of May. Sweet Worship Event. Morning Gate Church, 74 Morning Gate Drive, Fredericton, E3B0G6. Come for a night of worship led by bands from various churches around the area. Reception to follow. Come and celebrate the advent of the Christ Child with Becka deHaan, featuring songs from her ECMA-winning Christmas album, "Long-awaited, Unexpected." I am excited to come back to this endearing little country church for another Christmas concert. A big thank-you to Pastor Bob, and to the church as a whole, for such a warm welcome. Opening act is Dwane Drost. Directions: The church is located on Canada Street. Turn right off Kilarney Road, and it's on the left. This Advent season, join ECMA-winner, Becka deHaan, in exploring the joy, trial and triumph of Blessed Mary, and in proclaiming the Virgin Birth of Emmanuel, God With Us. There will be a free will offering with the proceeds going to the Fredericton homeless shelters. Join us for the third annual I Am Able Christmas concert! Music will feature the Nashwaaksis Middle School Show Choir, and a duet by Chris Bennett and Becka deHaan. There is no cost for this event. You are invited to join us at the Lincoln Baptist Church on November 26th from 6-8pm to “Worship in the Round.” This will be a time of worship in a personal, intimate atmosphere. All Christians are invited to come worship, seek the face of God and to sit in His presence as we unite ourselves together in prayer. There is no cost, and worship will be provided by the Lincoln Baptist Church worship team with East Coast Music Award winning recording artist Becka deHaan leading. Following our time of worship and prayer, a fellowship time will take place where snacks and refreshments will be provided. 3rd Annual "I Am Able" Barbecue: Friday, September 8th starting at 5PM, O'Dell Park. Free food, great friendship and live entertainment including from Becka deHaan. For more information, contact Paul Ross at 461-3047. Family Fun Day Fundraiser in support of Soul Care Counselling will be held at the Lincoln Baptist Church at 2275 Route 102, Lincoln, NB E3B 8N9. The fundraiser will run from 2pm-10pm on Saturday. There will be a bbq, cotton candy, popcorn, bouncy castle, children's activities, dunk tank, live outdoor music, and a drive in movie to end the night. All activities will be by donation. We hope to see you there! Check out my first-ever online movie review. Thanks to Vic and Walter Thiessen for allowing me to post it on their movie blog. Becka deHaan will be performing along with Nadia Moore, Barb Wilson and Abby Llego. Tickets are $20 and will be available at the box office or in advance by phone or online. The Patriquin Family along with the Nasonworth Baptist Church Choir will be participating. We will also be featuring recording artists, Barry Patriquin and Becka deHaan, as special guest singers. There will be a free-will offering. Come to the spring concert for I Am Able Ministries. Performers include the Nashwaaksis Middle School Show-choir and Becka deHaan. Tickets are $10 and can be purchased by calling Paul at 461-3047. NEW! my book is now available for sale at the Lighthouse Bookstore in Fredericton! I'll be having a book-signing there. Feeling the February blues approaching, that it's "always winter, never Christmas?" Come receive "a summer carol," with your copy autographed and a song or two performed live! This is a full an exciting Advent and Christmas season for Becka deHaan! The events calendar is below. Mark your calendars for the shows nearest you! Come to the third annual multi-piano Christmas event hosted by Dan and Edie Mullen! This year will be more of a concert than a carol-sing and will feature St. Andrews' own recording artist, Ruth Dunfield, and Becka deHaan, with selections from her ECMA-winning Christmas album, including the return of the O Holy Night duet, this time joined by St. Stephen's Helga Reiss-Brummitt. Don't miss it! Friday, December 2nd, 7PM: Light Spot Cafe in Saint John! Christmas Special with Becka deHaan and Duane Munn, Enjoy an evening of inspirational gospel songs from two local award winning artists. Light lunch will be served after the concert and a freewill offering will be received. For more information please contact Bonnie Phillips@457-1861. From Becka: I wish to thank the church for opening its doors to me for this its first concert of mine, and what better time of year? I'm looking forward to it! Becka deHaan - Christmas Benefit Concert with Special Guest: Bob Johnson & Carol Henderson with Rollie Waddingham. This concert is by donation only. All proceeds are in support of Becka’s new album project costs and promotion of her Christmas album. Becka will be participating in the Lincoln Baptist Church's Christmas cantata, as part of the choir. The choir will be performing "Festivals of Light." From Becka: This is my first time in a choir since my CMU days twelve years ago, so I'm really excited about this cantata! Becka is in charge of the music for the Lincoln Baptist Church's Christmas Eve service. 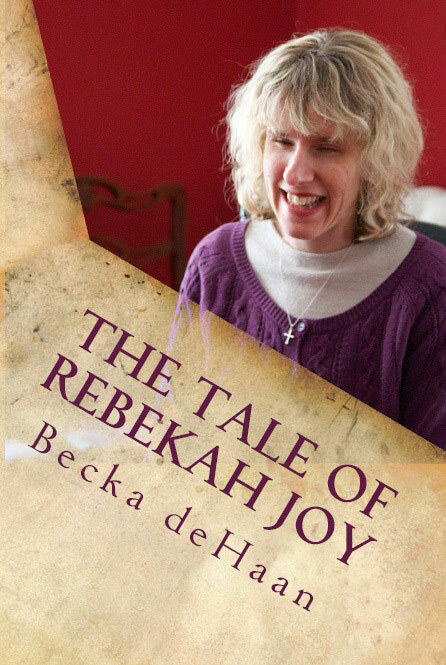 My first book, The Tale of Rebekah Joy: A Summer Carol, is available for sale! It is my life's story told as a fairy tale. "This is exactly the sort of tale which will connect with many people," writes my cousin, Janelle Thiessen van Esch, "because it explores the universal experience of being in a difficult place and longing for better days. The journey that Becka takes us on is one of vulnerability and faith. She examines the ties that bind one life stage to another, and how dreams and imagination can influence all areas of our lives. It is a true story, but with a touch of fairy tale wonder which flows so naturally from the context that it never seems to require a suspension of disbelief. ... [It is] a testimony to the triumph of faith and joy." $12 apiece directly from me. It will be launched officially on Sunday, July 10th, at Smythe Street Cathedral during the morning service: 10:00AM. A huge thank-you to everyone who made this endeavour possible: most notably Alicia Farnham as editor, and Laurie Mersereau, who assisted with the printing process. Becka deHaan will be in concert at All Saints Anglican Church in St. Andrews on Friday September 16th at 7PM. Becka deHaan returns to The Light Spot Cafe in Saint John on Friday, October 7th, 7-9pM, with special guests, Rose and Clayton Misner. Bethany Memorial Baptist Church is pleased to present In Concert, East Coast Music Award winner, Becka deHaan. Becka deHaan's style is described as "a traditional yet soulful, spirited sound." Blending her classical background with black and bluesy influences such as Eva Cassidy, Patty Griffin and Maria Maldaur, and adult contemporary influences such as Susan Ashton and Fernando Ortega, she produces a unique offering of both original and cover material on piano and voice, on flute and harmonica--an offering that has moved audiences to tears and roused them to standing ovations. Food and Fellowship to Follow Concert Freewill Offering. It is an honour and a joy to announce that I will be giving the very first Voice of the Martyrs concert ever to be held on the East Coast! See the poster (Its full text is below, for screen-reader users.) for more information. 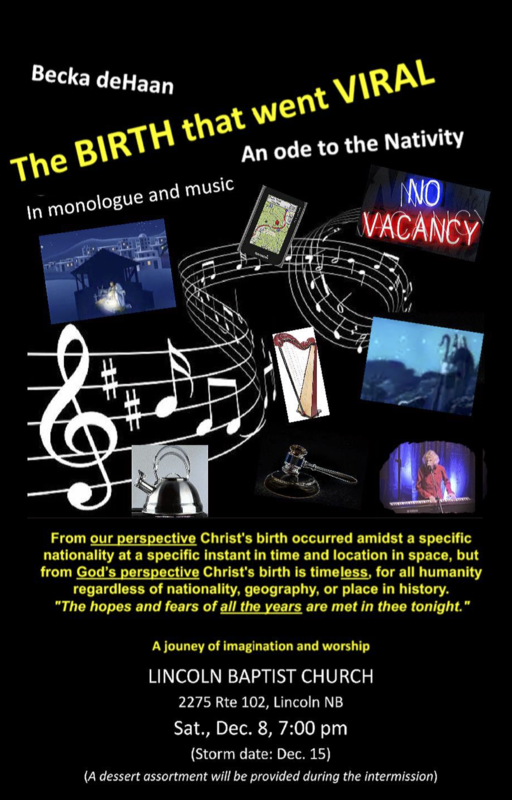 Becka will be performing for the ﬁrst time a song specially composed for those who are suffering for the name of Christ. She will also include two sets of original songs, as well as other well-known Christian songs selected to honour the persecuted. You do not want to miss this one of a kind concert! Registration is free and appreciated. The Voice of the Martyrs Canada is an established 43- year Canadian Registered Charitable Organization that provides spiritual and practical relief and support to Christians throughout the world who are being persecuted for their choice and expression of religious faith.